I made good on my resolution to enjoy the courtyard at work. I took my laptop and lunch out at noon. I only felt a little conspicuous because of the big window from the front reception that looks out to this space. But maybe I'll start a trend and others will join me. Today's picture is SOOC. Taking time to enjoy lunch instead. What SOOC goodies to you have to share today? Join in the SOOC fun with Melody at Slurping Life. I don't see anything on that table but STARBUCKS! Hi my name is Lisa and I have a 10$a day addiction to starbucks. 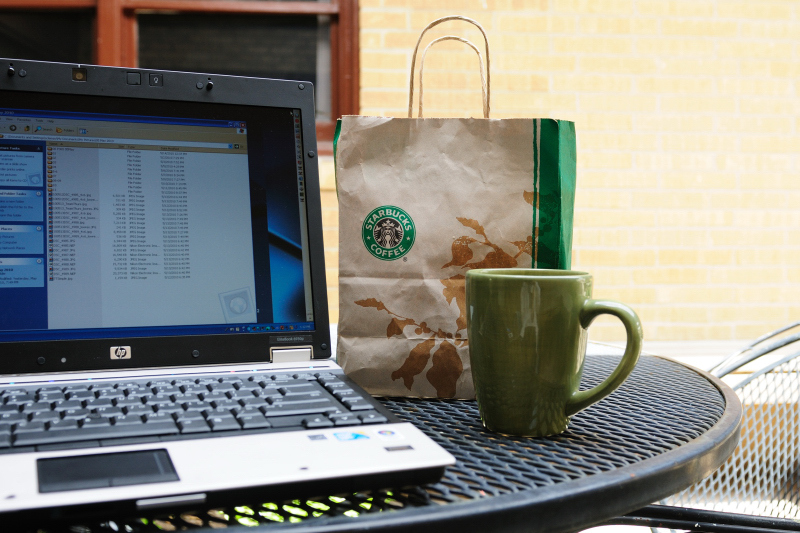 I really like this capture, fresh air, coffee, laptop what more could one want?! That looks absolutely wonderful! It's just missing a brownie or pastry, lol! I love doing that too. A great candid of your life! PERFECT!